TIME magazine has included FC Barcelona’s La Masia graduate, Lionel Messi, among the 200 candidates in their 2012 TIME 100 poll. The poll, which aims to highlight the 100 most influential “leaders, artists, innovators, icons and heroes,” is open to the public and voting is scheduled to go through Friday, April 6th. The nominee that receives the most votes will be included in TIME’s TIME 100 edition, which will hit the stands worldwide on Tuesday, April 17. The North American based magazine asks “will there be any end to Messi’s record breaking? Look out, Pelé: Messi may be the new greatest footballer of all time.” The Argentine, who is the only footballer on the list, figures alongside other household names like Jeremy Lin, Adele, Ron Paul, Barack Obama, Kate Middleton, Mark Zuckerberg, Usain Bolt, Novak Djokovic, Bruce Springsteen, Lady Gaga, George Clooney and José Andrés. The three-time Ballon d’Or winner, who graced the cover of TIME’s February 2012 edition, is currently having another record-breaking season with FC Barcelona. Messi recently broke the Club’s long standing all-time goals scored record set by César Rodríguez. Bobby Ghosh, who interviewed Messi for the TIME cover story in February, presents a couple of reasons as to why the Argentine should be considered the best player in the history of the sport. 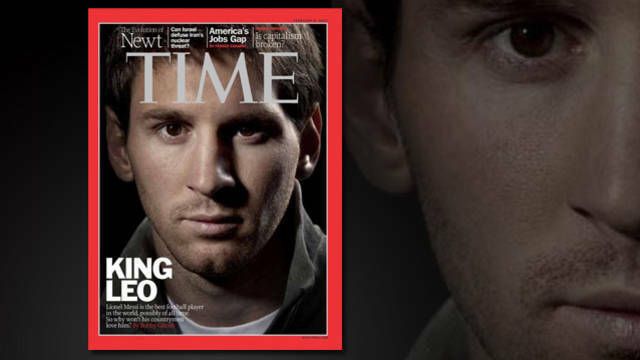 To vote for Messi in The 2012 TIME 100 Poll, simply click here. In the 2005/06 season, Rijkaard’s Barça lifted the Club’s second Champions League title in Paris. With Guardiola as manager, the Club would add two more titles. The first came in the 2008/09 season, in Rome, and the second, in the 2010/11 season, in the same venue of the 1992 final, at the legendary Wembley stadium. In total, three titles in seven years and six semifinals in the same timespan. The team led by Josep Guardiola continues to make history. With Tuesday’s victory over AC Milan in the quarterfinals of the Champions League, Barça are the first team to ever manage to qualify for five consecutive semifinals in the competition. It’s worth noting that the competition’s current format started in the 1992/93 season. This fantastic run was started by Frank Rijkaard in the 2007/08 season. On that occasion, Barça saw off Schalke 04 after beating the Germans in both the legs of the tie by 1-0. They were sent out of the competition in the semifinals by Manchester United (0-0 at the Camp Nou and 1-0 at Old Trafford). With Josep Guardiola on the Barça bench, in the 2008/09 season, Barça eliminated Bayern in the quarterfinals and Chelsea in the semifinals. In the 2009/10 season, Arsenal were Barça’s victim in the quarterfinals, however the Catalans were eliminated by Inter Milan in the semifinals. Last season, after eliminating Shakhtar in the quarterfinals, FC Barcelona sent Real Madrid crashing out in a memorable semifinal matchup. With Guardiola on the bench, Barça have always reached the penultimate round of the competition. This is the 13th time FC Barcelona have reached the semifinals of the Champions League in Club history. The first four times Barça made it to this round was when the competition was called the European Cup. They were in the 1959/60, 1960/61, 1974/75 and 1985/86 seasons – Barça played against Real Madrid, Hamburg, Leeds and Göteborg, respectively. In the competition’s current format, counting this season, FC Barcelona have made it to the semifinals on nine occasions. The first time was in the 1993/94 season, followed by the 1999/00, 2001/02, 2005/06, 2007/08, 2008/09, 2009/10 and 2010/11 seasons. The team played against Oporto, Valencia, Real Madrid, Milan, Manchester United, Chelsea, Inter and Real Madrid. Of the 12 match-ups played to date, Barça have managed to get to the final on six occasions. Of these, they’ve won the title four times. It’s important to point out that, in this overview, the 1991/92 season is not taken into account. FC Barcelona qualified for the final in Wembley after the group stage, they beat Sampdoria to claim Barça’s first European crown. Messi and Piqué both underwent an anti-doping test after tonight’s match. The team’s next training session is scheduled for Wednesday at 11:00, behind closed doors, at the Ciutat Esportiva Sant Joan Despí. Cuenca will give a post-training press conference. “It was a grand night, a fantastic response from my teammates. Today, more than ever, I’m very proud to be part of this great family called Barça,” said Dani Alves on his Twitter account. The defender also weighed in of the attitude of Guardiola’s team: “we knew that we had a great team in front of us and that the tie was difficult but the team responded perfectly. “In general, we put in a great performance on defence despite conceding a goal. They practically didn’t have any goalscoring chances, that’s due to the defensive work of the whole team. “This is how the manager prepared the match. We had to create a lot of chances and we knew that we had to score a lot of goals. “We started with a 3-4-3 because we needed players that would stretch out the field because Milan defends really well. “We prepared ourselves for this match really well. They have very offensive-minded players and they scored on us. The result is very just and we’re happy to be in the semifinals. “We played a bit better with four defenders because it was very dangerous to play with three. The match was more controllable with four. “We had to work hard against a great team. “We knew that a draw was good for them. It was the type of match to try and do everything we could to win. “I like being in the semifinals. I don’t care who we have to play against, we’ll know tomorrow; being here makes me happy. “With this being the fifth consecutive semifinal for the team… it means that things are working out really well and that the team’s desire is to go far. Gerard Piqué needed to come off the pitch due to injury on the 75th minute of tonight’s match against AC Milan. The defender was substituted for Adriano. After the match, the team’s Medical Services confirmed that the player sustained an injury on the bicep femoris of his left thigh. His recovery will mark his availability in Barça’s upcoming match. The Catalans will face Zaragoza on Saturday at 20:00. In a short time he’s gone from being on loan to Sabadell, playing in the Second Division B, to becoming a Barça first team player, having first played in the reserve team. Perhaps Isaac Cuenca could hardly imagine on the day of his official debut with the first team, on October 2oth, 2011, against Viktoria Plzen in the Champions League, that Josep Guardiola would include him in the starting line-up in the return leg of the quarter-final against Milan. “I have no time even to think about it. I’m enjoying the moment and each day I try to improve so I can help the team, and, in turn, become a better player” he said about the current dream he’s living. According to the Barcelona winger, the fact that Josep Guardiola chose him to be in the starting line-up against Milan was a complete surprise: “I just felt really happy, the truth is that I didn’t expect it at all. When I was told that I would be playing I was thrilled. I’m very happy”. In the same vein, Cuenca explained that once a player knows he’s in the starting eleven, “it doesn’t matter who you’re up against…….you just think about doing things the best way possible to help the team”. The rapid evolution of his career has done nothing to change his day to day routine: “I play in bigger stadiums with more spectators, and now people recognise me more in the street, but my life hasn’t changed”. Totally oblivious to the comments made about referees, and happy for Barça having achieved the fifth consecutive appearance in a Champions League semi-final, Cuenca said they think more about ” what we have done more than what is being talked about from outside…..we’re dedicated to playing the best possible way and not thinking about other things. We’re delighted to continue making history”.